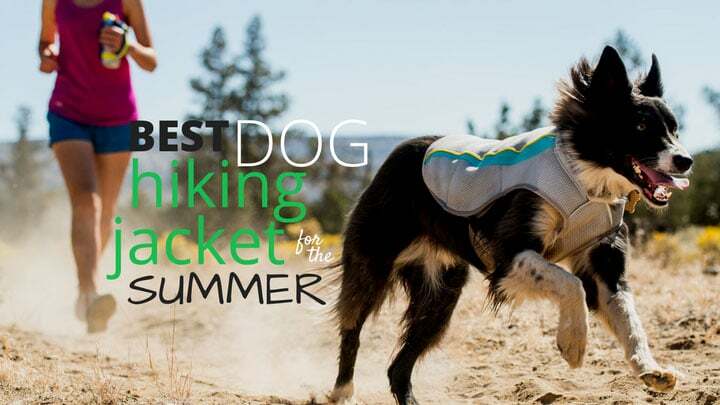 If you and your pup regularly enjoy numerous hiking trails of the great outdoors, they may be in need of their own dog hiking jacket or vest, especially in a hot or humid summer climate. A cooling vest can help in a 3rd way by wicking away some of the heat that accumulates along their back. Weather Appropriate. A hiking jacket for your pet should be appropriate for the temperature and climate of your area. With many seasonal options available, it may be that your dog deserves multiple choices depending on the time of year. 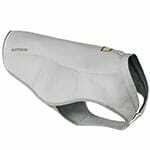 A summer hiking vest will need to be breathable and lightweight to ensure your dog doesn’t feel restricted or overheat. 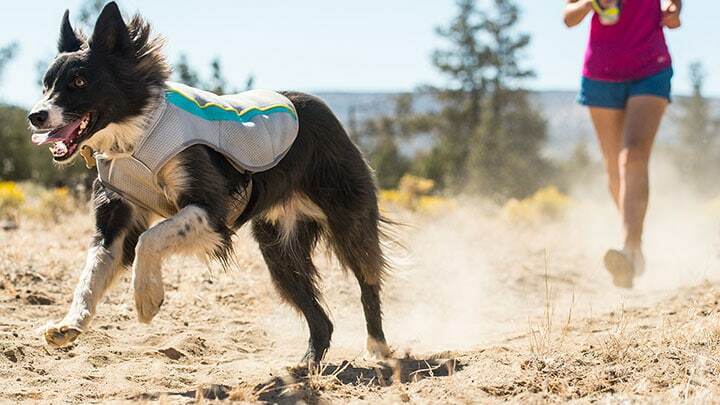 While it’s a little controversial, many people believe dogs release a lot of heat on their underside or belly, so it’s wise to choose a vest that wicks away heat on the top or backside only. Proper Fit. The fit is especially important in considering a dog hiking jacket, as you’ll need to consider how form-fitting it is for maximum agility on the trails. On a hike, you and your dog will be exerting a lot of energy, and will need the ability to have full range of motion. Choose a hiking jacket or vest that’s snug, but not overly tight to keep them moving freely and happily as you trot along. One specific area to pay attention to is how the vest wraps around the neck and chest of the dog. You’ll notice below that 3 of the jackets have a thicker material wrap around the collar area, while 2 of them utilize an elastic band that’s a bit thinner. Bonus Features. 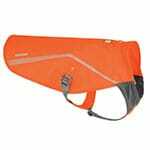 A good dog hiking vest should fit your needs for regular walks, but you may need a few extra features. Reflectivity and visibility. If you typically walk your pup in early morning or evening light, you may consider choosing a vest based on its visibility or reflective fabric. Leash portal. If you walk on-leash with your dog then you’ll either have to use a collar for the leash or ensure it has a leash portal (like the Ruffwear Swamp Cooler). Harness integration. Most harnesses will fit underneath a cooling vest, but the same issue with the leash my exist, so ensure there is a top opening. 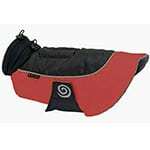 This sleekly designed Ruffwear Swamp Cooler Dog Cooling Coat is another excellent cooling option for your pet. It works the same as the Hurtta in that you submerge it in water before wringing it out and activating the cooling system. 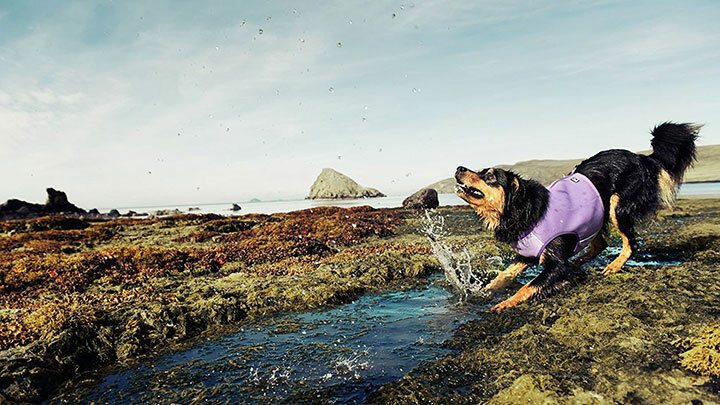 Evaporative cooling exchanges your dog’s heat with the coolness of the stored water in the cooling coat to keep them comfortable and ready to run that extra mile. Side-release buckles make for easy on-and-off and a reflective trim allows maximum visibility. 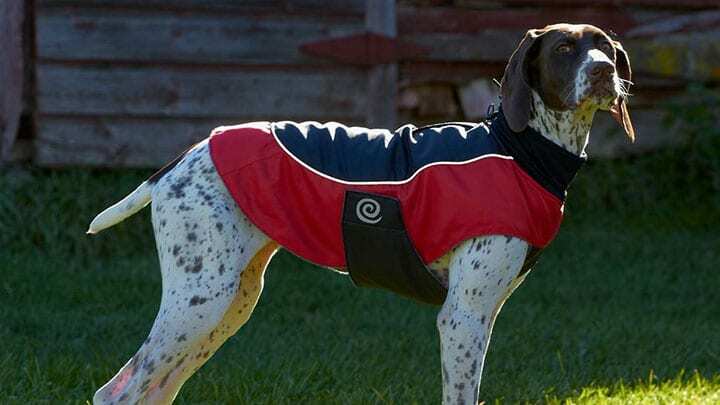 Fit for active pups, this coat will keep them cool and happy on the trails. Cons: No leash attachment, you must use a collar or additional harness. Perfect For: X-Small to X-Large pups ready to take on the trails. This lightweight Track Jacket Dog Visibility Jacket isn’t actively cooling on hot days, but it is breathable for warmer walks. 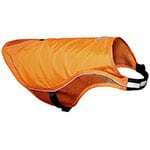 It’s reflective and highly visible bright orange color keeps your dog within sight on hikes and camping trips. The durable, waterproof safety jacket keeps your pup secure and within range without weighing them down or adding heat. Pros: Lightweight, breathable fabric. Highly visible and reflective orange coloring. Cons: No active cooling mechanism. Perfect For: Camping or hiking situations where you may need a lightweight jacket for your pup with added visibility. 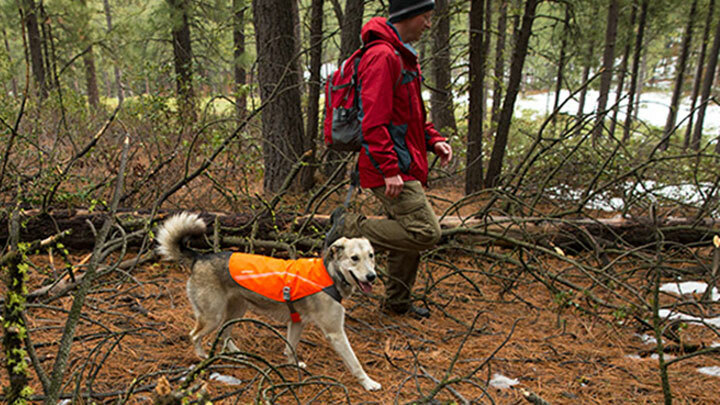 The Kurgo Reflect & Protect Active Dog Vest s a highly visible safety jacket for your dog to wear while on hikes that may lead into dusk or lower-light visibility situations. It has a flashing LED light strip along the sides and claims 360 degree visibility to keep your pup brightly seen up to 1,000 ft. away. 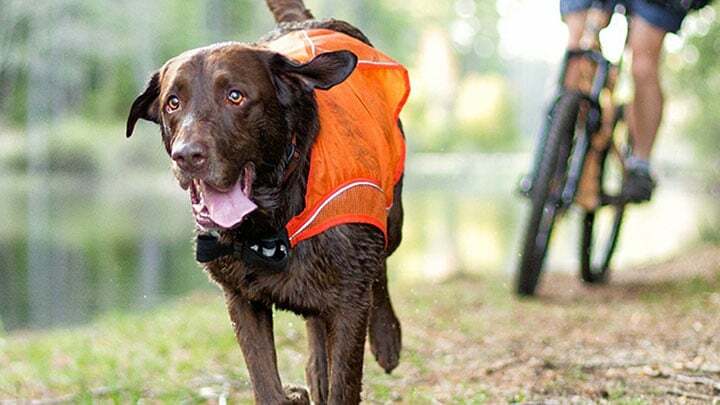 While they may not wander quite that far, this vest is excellent for keeping track of your dog if they’re trained to hike off-leash. The soft mesh fabric allows for comfort and breathability, especially during warmer weather hikes. Pros: LED lights add incredible visibility. Perfect For: Smaller, active breeds, and/or hunting. your dog and looks good in the process. With six available sizes and a drawstring neck for custom fitting, this cool coat will surely keep your pup happy on the warmer trails! Cons: No leash attachment on the coat, part of the coat covers the chest of the dog. Perfect For: Hiking hounds of all sizes. The Hurtta Motivation Dog Cooling Vest is an excellent hiking vest for those warm summer months where you don’t want your dog to overheat. Especially if they have long, furry coats, they’ll love this cooling vest on sweltering walks. All you have to do is dip the vest in water, wring it out, and put it on your dog to keep them cool and refreshed for hours. It claims to be both comfortable and nonrestrictive, and easily zips on and off via a back-length zipper on the top. Cons: Having to use water to activate the cooling mechanism could be a hassle. Perfect For: Any size pup that needs some extra cooling on a hot hike. We decided to limit this list of summer jackets to 5 to ensure you can’t go wrong with any of the picks. If you want a traditional cooling vest, go with the Ruffwear Swamp Cooler, Ultra Paws Cool Coat, or Hurtta Motivation Vest. 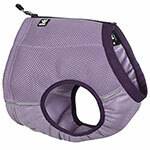 They are specifically designed with evaporative cooling technology in order to pull heat from the dog. On the other hand, super lightweight and breathable vests like the Ruffwear Track Jacket and Kurgo Reflect are great for maintaining visibility. 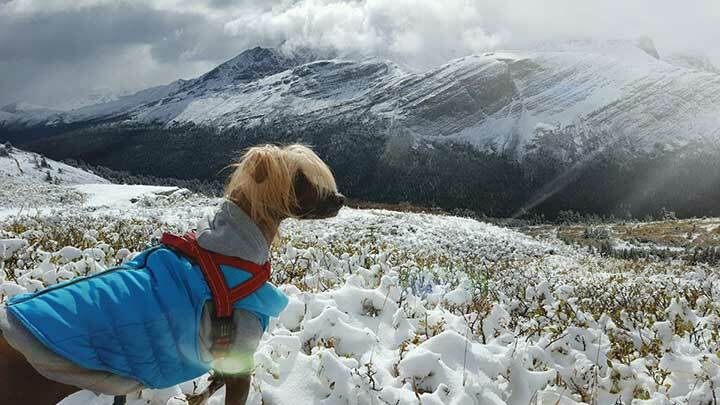 Lastly, if you’re going to be hiking in cold climates be sure to check out our article on the best dog hiking jackets for winter.